Universal Pictures warned its viewers for this film; the following text was printed in all the advertisements: "If you have a weak heart and cannot stand intense excitement or even shock, we are advising you not to see this production." But if "you like an unusual thrill, you will find it in FRANKENSTEIN." This Frankenstein adaptation came hot on the heels of another horror classic: Dracula, starring Bela Lugosi. Because of its success, Lugosi was originally cast as Frankenstein's monster. But as soon as it became clear that Lugosi's portrayal of the monster would a sympathetic one the was rejected for Boris Karloff. Creating the monster's appearance proved to be a challenge. 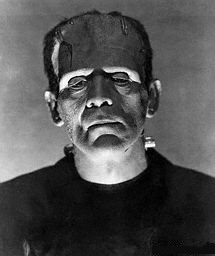 Each morning it took Karloff and the makeup artist 5 hours to pout on the costume and makeup, removing it took another two hours. Karloff had to appear taller so he had to wear huge boots which also had thirty-pound weights in the soles, thereby creating a lurching walk. The box-top headpiece creating the monster's high forehead completed the costume. The producer's father ("Uncle Carl" Laemmle), who was responsible for the warnings on the advertisements, was also responsible for the prologue that was to be shown before each showing of the film. In the prologue, Edward Van Sloan (Waldman in the film) warned the audience that people with weak nerves had better leave the cinema. Laemmle sr. was also the cause of the cutting of a pivotal scene in the film; he thought the scene where the little girl is murdered by the monster was too brutal to be shown. The script of FRANKENSTEIN (partly based on the play by Peggy Webling) takes much from the story lines of THE GOLEM (1922) and THE CABINET OF DR. CALIGARI (1919). Frankenstein (portrayed as a mad scientist) is seen at the graveyard together with his hunchbacked dwarf assistant, Fritz. He has already stitched together a body but is still in search of a brain. Fritz is sent to the medical department of the nearby University where he steals a brain. Unbeknownst to him, the brain is a 'criminal brain'. Frankenstein then has to wait for an electrical storm which will give the creature the spark of life. His professor (Waldman), his fiancée (Elizabeth) and his best friend (Victor) join him in his laboratory. They try to stop Frankenstein from going through with the experiment but he is adamant. When the creature finally moves, Frankenstein is hysterical with excitement, prompting the famous quote "It's moving, it's alive! It's alive!". As soon as the monster becomes troublesome, Frankenstein chains him in a dungeon where he is harassed by Fritz. Filled with rage, the monster manages to breaks free, kills Dr. Waldman and Fritz and escapes from his prison. While roaming through the countryside, the monster meets a little girl. She is not afraid of him and together they playfully toss flower petals in the water. When all the petals are gone the monster becomes incredible angry and flings the little girl in the lake where she drowns. The little girl's father finds her body and brings in to the town mayor who swears revenge for this senseless murder. In the mean time, Frankenstein, who believes that Waldman has destroyed the creature, is making plans to marry Elizabeth. As she is looking at herself in the mirror, the monster who is in search of his creator crashes into the room. Frankenstein reacts quickly and manages to drive the monster off. Together with the villagers he hunts the monster through the night. The monster manages to grab Frankenstein and drags him into a windmill. The do battle with the monster apparently ending on top as he hurls Frankenstein from the top of the windmill to the ground. However, his fall is broken by one of the windmill's arms. The villagers witness this and quickly set fire to the windmill; it burns to the ground seemingly killing the monster. Frankenstein recovers from his injuries and eventually marries Elizabeth. Director James Whale and Boris Karloff on the set of 'Frankenstein'. Boris Karloff as the Monster in the 1931 film. Cinemania '97. CD-ROM. United States of America: Microsoft Corporation, 1992-1996. ©1999 - 2011, Webmaster My Hideous Progeny.